Imagine my surprise, three days into my new philosophy when I was confronted with this statement. 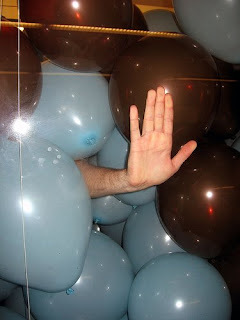 Once I’d stopped thinking about the issues of working in a room filled with balloons (intolerable squeaking for example), I managed to regain enough composure to be taken aback. What the heck was he talking about? Balloons? It turned out that he’d read the http://www.positivesharing.com/ website that I’d recommended, and from the whole online book content, he’d come away with the one, slightly tongue in cheek, suggestion that you could fill a room with balloons to celebrate achieving a happy work place. What I was most shocked about, was how easy it was for a wide-ranging principle to be reduced to, and judged by, one tiny component. It’s like judging the career of a well respected Shakespearean actor by his one night of passion with a transgender lap dancer. Ok, that would be pretty big news, but you get my point. I got to thinking how this happened, and I came to the conclusion that people like, or even need, to have something definable to latch on to. If you don’t provide them with something, then they’ll go looking for something themselves, and it’s quite possible that it’ll work against you. I decided to write a set of principles that defined the philosophy. I figured that if I put that in front of people, it’d be much harder to miss the point of what we were trying to achieve. As with all my ideas, I roped in my trusted team mates (and even the MD) and got general approval that the list I’d created (I’m calling it our “manifesto”) was worth a go. It certainly wasn’t a “monkey chucks a stick” moment, but at least the questions everyone asked were answered, and the general mood was positive. In my next post, I’ll publish the manifesto. We haven’t put it forward to the rest of the company yet so there’ll be more to update you with when I’ve seen the whites of their eyes. Until then, I still recommend the http://www.positivesharing.com/ website for inspiration, but watch out that the balloons don’t… err… deflate you. Sorry, that’s the best I’ve got.